Gerry Adams steps down as Leader of Sinn fein. On the news at nine o’ clock is the announcement that Gerry Adams is to step down as leader of Sinn fein. Gerry Adams has held the position since 1983 which is over thirty four years, quite a achievement in a modern political party. Gerry Adams has led a chequered career in Sinn fein, he ended the “armed struggle” alongside Martin McGuinness who died earlier this year and signed up for the controversial Good friday agreement. He has built up a political organisation with seats at the Dáil, Westminster and Stormont assemblies. The party has become a lot more numerous than during the “armed struggle” as seen during their ard fheis in Dublin. However the movement he leads tends to take one step forward followed by two steps backward. He put in a highly suspicious performance during the 2007 Dáil elections. letting Micheal McDowell land some punches on him about Farc and the sum of twenty five million allegedly obtained from them despite knowing that some PD’s were “ansbachers”. Nobody asked him to explain his showing and he largely lost the election for Sinn fein. Some form of blackmail seemed to have been used. Adams led/leads a movement that is chock full of informers, touts and spies. One wonders what the future holds for Sinn fein and will they get their referendum on Irish unity in the years to come, everybody needs to play for team Ireland to win that one. History will write on Gerry Adams and his legacy in the fullness of time. 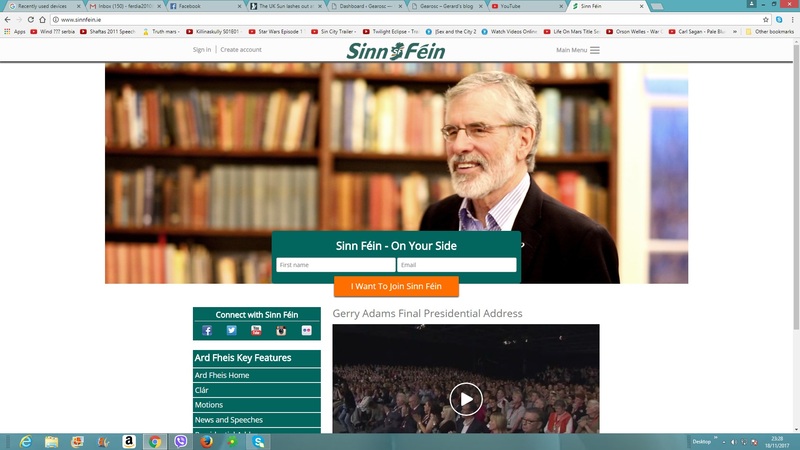 Author adminPosted on November 19, 2017 December 11, 2017 Categories Ireland PoliticalTags Gerry Adams, Sinn feinLeave a comment on Gerry Adams steps down as Leader of Sinn fein.